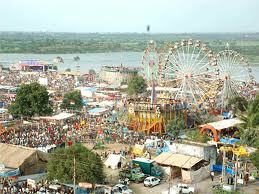 Tarnetar Mela will Coming on 19 Saptember to 21 Saptember of 3 Days and Gujarati Month Bhadrapad Choth means Ganesh Chaturthi. 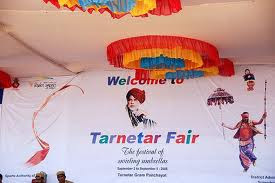 The Tarneter fair is organised in Tarnetar village some 39 kilometres from Chotila in Surendranagar District in Gujarat. 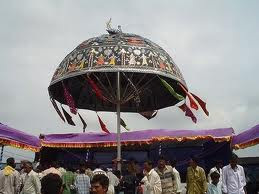 It is popularly known as the Trinetreshwar Mahadev Mela and revolves around the sacred temple of Trinetreshwar.The Tarnetar Fair is initiated with the hoisting of a huge Flag on the dome of the Trinetreshwar Temple. 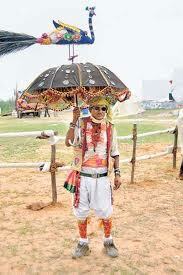 The flag is hoisted every year only by the Mahant of Paliyad, a small village near Tarnetar. This tradition has been followed ever since Mahant Visaman Bapu who was born in Paliyad started the ‘Sadavrat’ at Paliyad and hoisted the first flag at the Tarnetar Temple. On Bhadarva Sud 4 (Ganesh Chaturthi) the flag is carried in a procession headed by the Mahant from the office of Tourism of Gujarat to the Trineteshwar Temple. 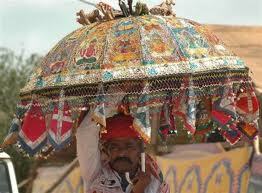 It is then unfurled to symbolize the commencement of the colourful festival. 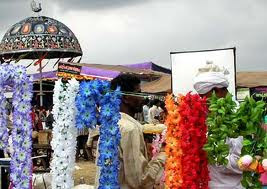 The fair coincides with the festival at the Trineteshwar temple (three-eyed god Shiva), celebrating the wedding of the legendary 'Mahabharata' (epic) hero, Arjuna with Draupadi.The Trinetreshwar Mahadev Fair popularly called the Tarnetar Mela is an exciting and a unique fair held annually at Tarnetar in Saurashtra. 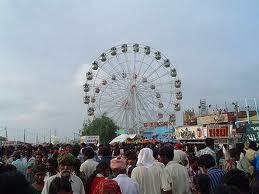 In the first week of 'Bhadrapad' (August-September) Tarnetar is transformed into a whirl of colour and excitement. 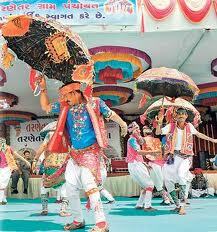 The Tarnetar fair is one of the most colourful events in the state ofGujarat. The temple heavily renovated in the 19th century, is believed to be the site where Arjuna won the hand of Draupadi in an archery contest. The popular belief associates the village with the 'swayamvar' (marriage) of Draupadi after Arjuna performed the 'Mastsyavedh', an incredible feat of archery. 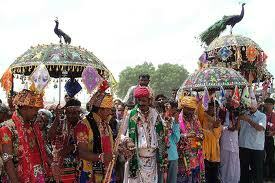 Tarnetar fair is Grand Celebration in Villege of Tarnetar.The special feature of the fair primarily created to fulfil social needs for members of Bharwad community, is that their matrimonial alliances are struck here (hence the reason for gorgeoustraditional costumes worn by the people), a time-honoured ritual that is still practised. The temple courtyard resounds with devotional music. This fair is primarily a 'marriage mart' or 'Swayamvar' for the tribal youth of today who still visit Tarnetar, to find them a suitable bride. The tribal youth elegantly dressed in colourful dhotis, waistcoats and eye-catching turbans come to be chosen by village belles dressed in colourful finery. 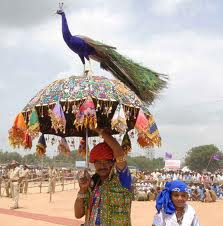 The beauty of this fair is in its impulsiveness with which the people joyously break into folk songs and folk dances to the rhythmic accompaniments of drums and an assortment of folk instruments. 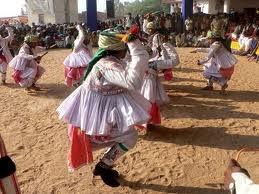 The young, men and women, swing and sway in gay abandon to the throbbing rhythm of the 'ras garba' and the 'hudo' dance. accompaniment of four drums and 'jodia pava' (double flutes.) 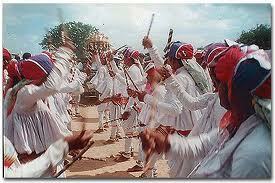 their gorgeous traditional costumes and captivating dances makes the Tarnetar Fair a unique synthesis of folk art.